One hundred and fifty posters collected from trains and railway stations may not sound like the makings of an absorbing exhibition. But then again, the London Underground – one hundred and fifty years old this year – is no ordinary railway, and in much the same way that the humble tube map has become a design icon and inspired countless works of art in its own right, many of the posters that have adourned the carraiges, platforms and escalators of the London Underground over the past century and a half are now regarded as great works of art in their own right. They have informed, amused, reassured, reminded, entertained and inspired the countless millions who have used the London Underground over the years, and today stand as fascintating insights into the way Londoners saw their tube, their city and their world in the eras in which they lived. 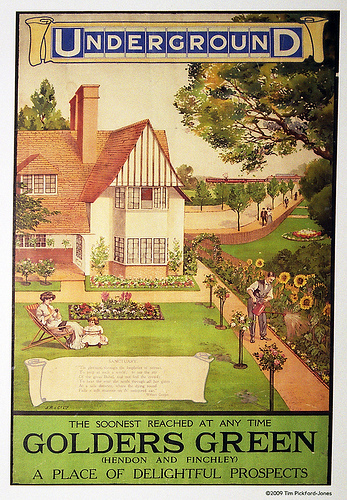 A suffragete-era woman tells us that the underground is the ‘way for all’; evocative, romantic images of green and pleasant lands from the 1920s and 30s scream at us to come and live in the suburbs; a wartime poster asks us to be patient while repairs take place to the stations; and one from the 1980s urges London’s youth to keep the volume on their personal stereos down. This is nothing less than social history! Okay, you may be thinking, so what? Any mundane everyday object from any era can tell us something about the people who used it or made it. 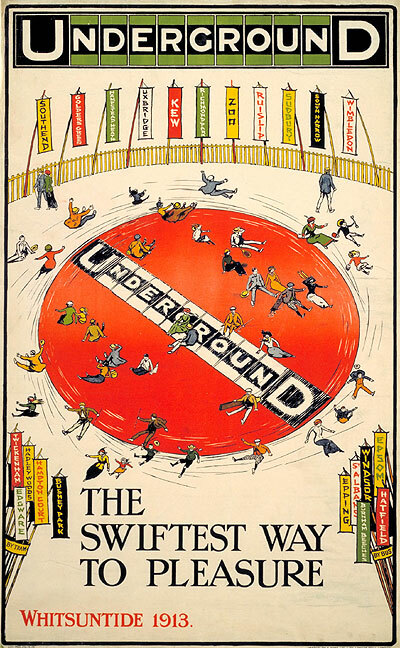 But what is so remarkable about the poster art of the London Underground, and what the London Transport Museum’s Poster Art 150 really brings home to us, is the extent to which the London Underground was a genuine patron of the arts, especially during its golden age of poster art during the inter-war years (from which most of the posters in this collection are taken). For this we can thank two principal figures, general manager and chairman Albert Stanley (later Lord Ashifield), and marketing strategist, subsequently commercial manager, Frank Pick. Almost as soon as Ashfield and Pick arrived at the Underground Electric Railways Company of London (UERL), in 1906 and 1907 respectively, they took it upon themselves to introduce the public at large with modern art, and invited them to engage with it. Young artists straight about of art school were taken on to both produce bright and colourful images to make this strange subterranean world more pleasant and more welcoming, and deliver ever-more bold and increasingly abstract designs to help convey the Underground as the very manifestation of modernity itself. Take, for instance, the numerous examples in the exhibition portraying electricity, a mysterious and potentially terrifying technology that many of the Underground’s early 20th century passengers would not have had in their homes. 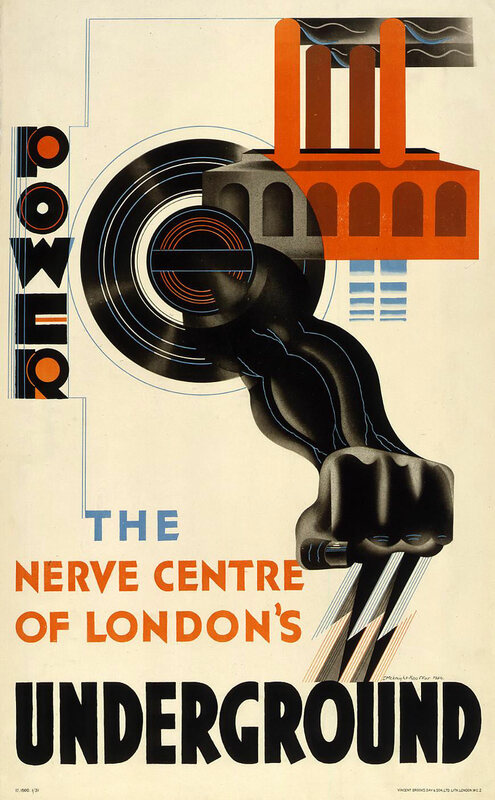 In Edward McKnight Kauffer’s ‘Power: The Nerve Centre of London’s Underground’, it is the beating heart of the network, literally driving everybody forward into a brave new world. Or, take that other great symbol of all that was modern, speed, evoked brilliantly by Alan Rodgers (you can get his poster design on a T-shirt in the museum gift shop). Or look at how idyllic and magical life in the new suburbs, or ‘Metroland’, was portrayed. This was a new and better way of life – the modern way of living – and it was being made possible by the Underground. The fact remains, however, that even this marvellous collection of art barely does Frank Pick’s monumental legacy justice. The Underground, and indeed much of London itself, simply would not look and feel the way it does today without him. 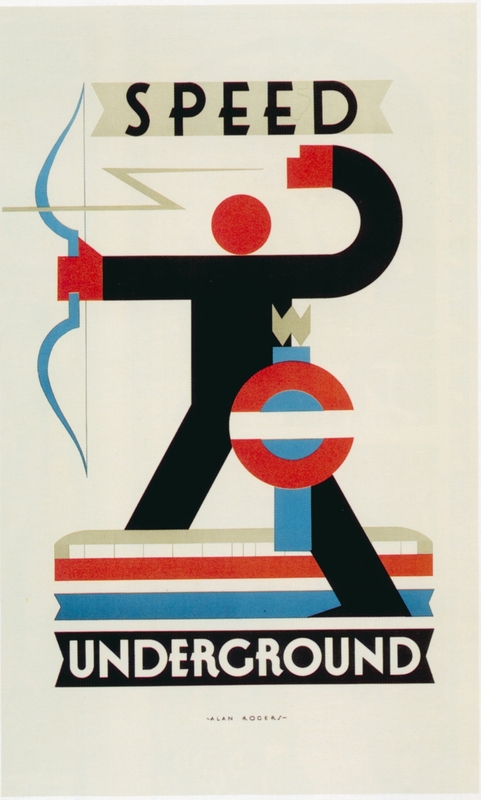 His grand vision for the Underground incorporated all aspects of design, and the list of celebrated design innovations that were commissioned under his watch is impressive – the famous roundel logo, Edward Johnston’s instantly recognisable typeface, Charles Holden’s Art Deco station masterpieces and Harry Beck’s legendary map. Today, it is easy for us to look upon this body of work as simply a style, an aesthetic, a look, albeit a particularly enduring one. But for Pick, all aspects of his grand plan were about, first and foremost, function. It all had a very pragmatic aim in mind – to increase the number of off-peak journeys made, and increase the company’s revenue to ensure the network could pay for itself. When he wasn’t employing and instructing artists, designers and architects, Pick was drawing up regulation to standardise the size and positioning of poster advertising on platforms so that the station names (signposted for the first time in the roundel logo) were clearly visible to passengers. And when he wasn’t doing that, he was persuading – or in some cases forcing, by lobbying parliament – London’s bus, coach, tram and mainline railway companies to restructure their routes and their schedules so as to compliment, rather than compete with, the Underground lines. The schedules, the new suburban routes, the branding, the architecture, the map, and the posters, were all carefully designed to ensure that the newtork was as uncomplicated and easy to navigate as possible, thus ensuring that Londoners would feel just as happy to use it in their leisure time – to catch a show, go shopping, or visit the countryside – as they would to get to work. 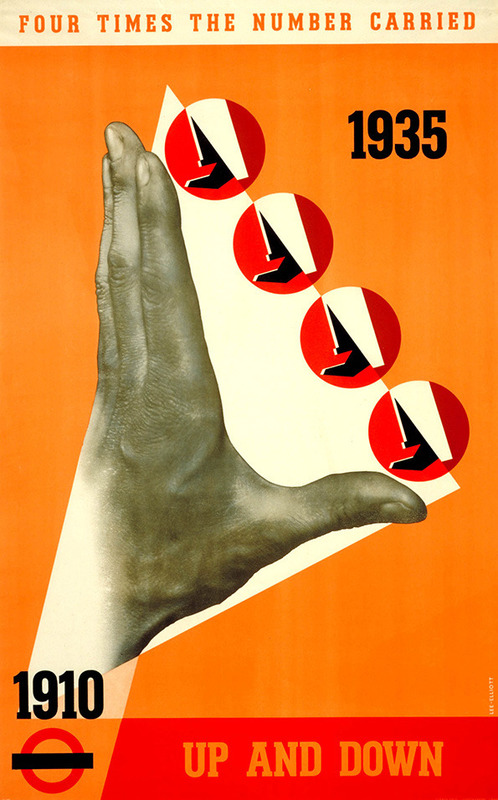 Most of my favourite posters in the exhibition were on the theme of leisure. Some urge Londoners to explore their city and visit museums, galleries and landmarks (ironically London Zoo, not the easiest of attractions to visit by tube given no nearby station, is the most often featured tourist destination of all), while others feature particular events such as Cup finals, exhibitions and roadshows at Olympia or Earls Court. Then there are the posters promoting travel beyond the limits of London (both Uxbridge and Watford are portrayed as idyllic countryside retreats, now reachable by the Underground), either for a day trip or perhaps just to catch a glimpse of a picturesque sunset. I particularly enjoyed Charles Sharland’s 1913 playful image of a joy wheel, a fairground ride of sorts, popular in Britain at the time, that spun people around and threw them off as it accelerated. Here it is used to symbolise the swift and easy travel from the heart of the city into the surrounding area that one can take advantage of come the next Whitsuntide holiday. More than any other poster, it reminded how in this era, particularly for most of the working classes, the very idea of leisure time was quite a novel one. It was the era when a bank holiday was a real event, when a huge chunk of the urban population across the country would take off to the seaside, to a funfare, a circus or a holiday camp. It was the golden age of the great British day out, and I love how the joyful exuberance and childlike excitement of the experience is captured in Sharland’s poster. Ashfield and Pick, and the artists they employed, may have given the London Underground its distinct identity, but the poster that celebrates an achievement that probably mattered more to them at the time is Theyre Lee Elliot’s effort from 1936, that boldy states that passenger numbers were four times in 1935 what they had been in 1910. Today, the London Underground carries over a billion passengers a year, and even with relentless upgrades, increases to capacity and new lines, it struggles to cope. I wonder what Frank Pick would have made of that. It is a slight pity that there was not a little more room for this collection in the exhibition’s two-floor gallery. Some of the posters are quite large, and are best seen when standing some way back from the wall, which is often not possible here. None the less, it was still a treat to see them in the flesh like this, and the maze-like layout in some parts meant you didn’t always know what was coming up around the next corner. I also love the fact that you get to vote for your favourite poster at the end – I went for the Golders Green one! Poster Art 150 runs at the London Transport Museum in Covent Garden until 27th October. Whilst the exhibition itself is free, entry to the museum is £15 (£11.50 concessions), which buys you a year-long pass. If you are a Londoner then it is quite simply unmissable. POSTSCRIPT (12th October 2013): Due to popular demand the exhibition’s run has been extended. It will now close on 5th January 2014. 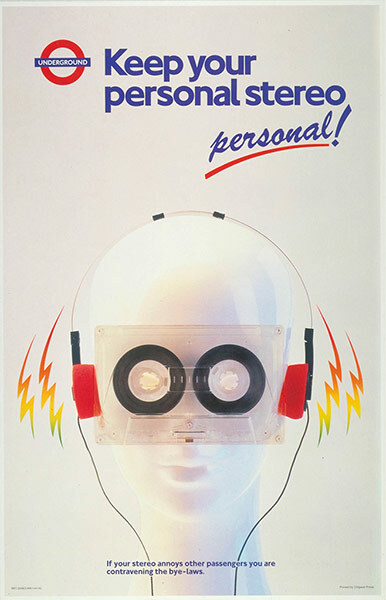 There’s some more of my favourite posters from the exhibition on my Pinterest page. See them here. Tags: advertising, Alan Rodgers, Albert Stanley, architecture, Britain, Charles Holden, Charles Sharland, Design, Edward Johnston, Edward McKnight-Kauffer, electricity, exhibition reviews london, exhibitions london, Frank Pick, Harry Beck, leisure, London, London Transport Museum, London Underground, London Zoo, Lord Ashfield, metroland, modernism, parliament, poster, Poster Art 150 Review, roundel, suburbs, Theyre Lee Elliot, typeface, UERL. Bookmark the permalink.